Bless Box is a monthly lifestyle subscription box for women. Each box will include items in the beauty, health, food categories. 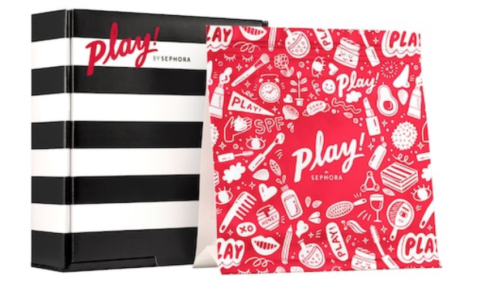 This box comes with card sharing the theme of the box. For complete product details, there’s a link to download a PDF. Also, the box and this print were designed by Dear Giana – an eight-year-old artist! Amazing! This lip liner is a twist up – no need to sharpen it, and the formula is soft enough to glide on easily. I have a few of these palettes now thanks to Boxycharm and FabFitFun! This collection is the violet smokey eye set – a combination of mattes and shimmers. These bracelets are made with wax coated string, so they are super durable, and they are easy to adjust for a perfect fit, too! I first discovered True Lemon thanks to Vella Box, and now I totally get the appeal! If you aren’t familiar, this is a simple way to add lemon flavoring to drinks, recipes, etc. And the ingredient list is simple – just citric acid, lemon oil, and lemon juice! This roll-on is a blend of Eucalyptus, Peppermint, Tea Tree, Lemon, Siberian Fir Needles, Cardamom, and Bay Laurel. One sniff and I was instantly alert – this will really wake you up! I LOVE Dang Coconut Chips! And these caramel sea salt ones are extra good! It didn’t irritate my skin at all, and the scent was subtle, but I have to admit – I didn’t really notice any difference in my skin after using it. FYI – The Chaleur Heat Penetrating Mask was listed on the digital card, but wasn’t in my box. I’m assuming it was supposed to be in all boxes and mine was left out accidentally, so I’m going to reach out to Bless Box to get a replacement. Can you still get this box if you sign up today? Possibly. The Subscribe page is still messaging the September box. I’ve reached out to [email protected] to ask. I’ll update once I hear back. Coupon –Use coupon code WELCOME to save 10%! Iv been wanting to try the BlessBox but unfortunately after reading mostly negative reviews I will not be spending my $40 per month Plus $7+ in shipping…. I’ll keep looking . Thanks everyone……. This looks like a great box and is being added to my Wish List. I love the True Lemon (and Lime) packets. I sprinkle them on fresh fruit (love it on Granny Smith apples best) to add a little zing; it seems to bring out more of the flavor of the fruit. Dang is SO DANG good! This flavor looks super yummy! Thanks for the review, Liz! I have had a 6 month membership off of a Gilt offer and will not miss it when it expires next month. The value is really hit or miss and the box curation never makes any sense. It really feels like the box is just filled up with whatever is around. Sometimes there is a decent value other months it is a handful of dollar store left overs. Bottom line, I am never excited to open it and never feel like it is a “treat” to myself.. so it will be goodbye. I totally agree! October is my last month too and I can’t wait to be done. I noticed the mask on their digital card and saw that no one was receiving them in their boxes on IG reveals. So I inquired about it via FB and after that that I saw that Bless Box changed their info card to a coupon and then told me via FB post that the mask was a mistake. HOWEVER, after that and a week long delay with my box shipping, when I did get my box I did get the mask… And others as well. TBH there is a lot of inconsistencies lately. A few months back the info card said we would be receiving a HUM giftcard in our boxes, yet none we’re included. After inquiring about THAT issue, they were in the following months box. I’ve been thinking about trying this box but I keep talking myself out of it. I haven’t been able to find consistent reviews anywhere. There’s always a month here or there, but I haven’t seen enough (on any of the sites of blogs I follow for this stuff — not just MSA) to get a real good sense of whether or not the box has consistently good products. Also $40 a month is a lot and I don’t think they release spoilers anywhere, so you go into it blind. I’m interested in hearing from anybody who has tried this one before. I’ve gotten a few months of this box and it’s pretty much the same things every month. I’ve gotten I think 4 in total and I’ve ALWAYS gotten some sort of mask, a lipstick, eyeshadow/palette, and these awful paleo bars that just about break my teeth. There are some items I really did love – Some really thick comfy socks in one box, a baseball cap I wear pretty much everywhere, a nice full size Kerastase hair product, and I do enjoy the masks – but there is nothing that’s WOW or feels like a treat or different from other boxes. I am especially disappointed in the amount of makeup I receive considering it advertises itself as a lifestyle box. I’m also disappointed in the number of items that are sample size when I pay a few dollars more (and no shipping) for other boxes to get full size products. I know it’s a new box – not a year old yet – but they really need to step up their game if they want to keep customers. Their first couple of boxes wowed me and got me to sign up (I didn’t receive those, I just saw reveals) but they’ve definitely been hit or miss and more on the lackluster side. Abby, I’ve only been subbing to this box for 3 or 4 months (can’t remember exactly). I had been eyeing it and when they had the box with the Kerastase product, I finally caved. I LOVE all things Kerastase. They even allowed me to purchase 2 extras boxes that month for my daughters…and both of them LOVED LOVED LOVED it. Yes, there are some “drugstore” brands in the box. And yes, the curation seems a bit wonky at times. But I honestly think the value is there. I like the little snacks they send (except, as someone mentioned already, those awful bars). Last month was a really big miss for me but I like at least half of the box this month. And to me, that’s pretty much the same as most other boxes. For example, PSMH is a box that is either a really big miss for me or I like most of the box. And I find that for PSMH, I’ve disliked more boxes than I’ve loved. But the ones I do love, I really love. I do wish Blessbox would add more “lifestyle” items and a little less make up. I wouldn’t mind seeing more home goods, like candles and such. But I’m not ready to throw in the towel yet. I will stick it out a few more months and see where they go with it. If they continue with “mostly makeup”, I will eventually stop subbing, since I already have more make up than I know what to do with. I emailed them as well regarding my missing mask. Has been over a week now, no reply.